These Executive Metal Cable Ports add that touch of finesse to any desk or worktop, and are available in numerous profiles which all fit industry standard round holes. This particular Eclipse port whilst being available as a 60 or 80mm option, are also available in a choice of depths - a standard 21.3mm or a shallow 12mm option. 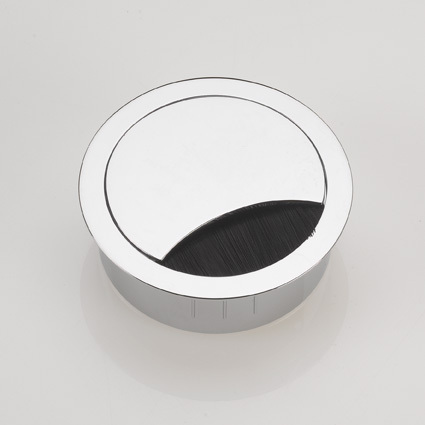 Most Ports are available in a choice of finishes including Bright or Brushed Chrome, Matt Stainless, Aluminium, Black Nickel and High Gloss White and all have a brush lining which closes neatly round the cables meaning you don't get any unsightly holes in the worktop. As well as looking great these ports don't compromise on the funtionality side of things, allowing for the safe passage of cables through desks and worktops. � The dimension listed is the approximate hole size required for the ports to fit into & remember to check the drop-downs for colour and finish options. These ports create a wow factor and look great in reception areas, boardrooms & prestigious develpments, as well as premium furniture ranges.